The following letter was sent from George Gersema (CEO) and Mary Gersema (COO) to Employers Resource employees regarding the company’s decision to re-design the logo. The spirit of entrepreneurship is what led us to open our doors 30 years ago. It is this very spirit that we are passionate about setting free and protecting for all the clients we serve. We wanted a visual representation of the passion we have for keeping this bold spirit of entrepreneurship running free in this great country. We’ve found the wild horse fits the bill. There is a spirit about them, a drive, an urge, and a tenacity that can’t be fenced in. This is why we chose a wild horse to represent this spirit that we are so focused on protecting. The dreams of business leaders are our country’s most valuable resource. We strive to be the most valuable resource these business leaders can find to help them in this endeavor. We believe in allowing these leaders to have the freedom they need from HR and administrative details to reach their dreams, do more of what they love to do, and continue building greatness. This is how their spirit will avoid being tamed or broken. 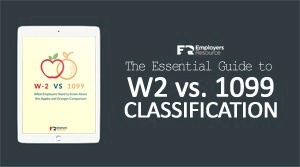 Employers Resource has been viewed as a constant pioneer in our industry. A landmark of stability, trust, and a guardian in the midst of much chaos and instability over the years. But, our PEO service is much more than simple guardianship. We empower them. We unharness them. We offer them an entirely new, unique and progressive way to run their business. We believe this new visual representation of our identity also reflects our goal of reaching business owners of ALL ages via more modern digital channels. It is as much looking forward to the future of our PEO solution as it is a reflection of our bold and free past. This logo is a tip of the hat to the entrepreneurial spirit in all of us here at Employers Resource. Thanks for helping us keep this spirit running free in our clients by removing the details that can keep them from answering their most important callings.